Most people spend hours each day watching programming on their TV set, however, many people might wonder how in fact television works. There are many parts to this process and many technologies that are involved. Following are the most important processes and technologies involved in making television work. There are many major elements that are required in order for TV to work. They usually include a video source, an audio source, a transmitter, a receiver, a display device, and a sound device. The video source is the image or program. It can be a TV show, news program, live feed or movie. Usually the video source has already been recorded by a camera. Besides the video source, we also need the audio source. Practically all movies, TV shows and news programs have some sought of audio. Audio source can be in the form of mono, stereo or digitally processed to be later played back with surround sound. The transmitter is necessary for broadcast television companies that broadcast a free signal to viewers in their area. The transmitter transmits both the video and audio signals over the air waves. Both audio and video signals are electrical in nature and are transformed into radio waves which can then be picked up by receivers (your TV set). A transmitter not only transmits one channels audio or video signal, but in most cases many different channels. A receiver is usually integrated in your TV set and this receiver is able to grab radio waves (the transmitted signal) and process these radio waves back to audio and video electric signals that can now be played on your TV set. A display device is usually a TV set, but can also be just a monitor. The display device is able to receive electrical signals (usually sent from the receiver) and turn these electrical signals to a viewable image. 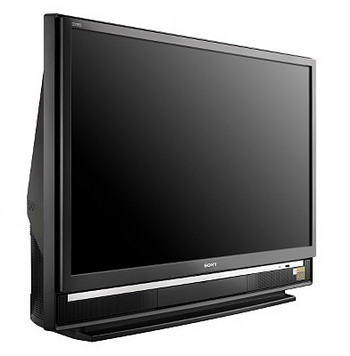 Most standard TV sets incorporate a cathode ray tube (CRT), however new display devices can include LCD (liquid crystal display) and Plasma (gas charged display) display devices among others. While most sound devices are built into your TV set in the form of speakers. Audio signals are obviously needed to match up with the video being shown to the viewer. Many newer TV sets have outputs to send the TV sound to high quality speakers that reproduce sound much better. Since audio signals can include surround sound technology, the TV set is able to send audio signals to the proper speakers located around your room. There are three major ways to receive television broadcasts. They include Broadcast TV, Cable TV and Satellite TV. Broadcast TV is usually defined as TV signals which are transmitted from a terrestrial source, usually a transmission tower. Most broadcast TV signals are free to anyone with a receiver to pick them up. They include traditional TV channels that broadcast standard TV signals on specific radio frequencies. Television signals are transmitted on a range of radio frequencies (RF) that includes Bands III, IV and V.
VHF (Very High Frequencies) are channels that include channels 2 to 13. UHF (Ultra High Frequencies) are channels that usually include channels 14 to 83. The Reason for using these Bands is that these radio frequencies are great for carrying TV signals (both audio and video signals). These bands provide high quality audio and video with reatively low interference. These radio waves have a long range and can penetrate structures such as walls and building exteriors. Satellite TV uses a different form of transmission. Instead of transmitting signals from the ground, satellite TV transmits from satellites orbiting the earth. Satellite signals are usually digital and encoded and compressed. They require special antennas pointing in specific directions to pick up specific satellite signals. These signals must then be decoded or unencrypted and decompressed to view on a TV set. This usually requires special equipment and most satellite TV services operate on a pay per service fee. Cable TV is another way to receive TV broadcasts. Instead of the TV signals being transmitted through the air, they are collected from a certain point, and sent from the cable company directly to your home via cable. Just like a phone line is laid from the phone company to your home, so is cable TV. There are many types of cables that are used including copper or fiber optic and the signals that the cable company sends to your home usually are encoded and or compressed. Most homes require technology to unscramble and decompress the signal to view the TV signal on their TV set. There are many parts to a TV set that allow you to view video images and reproduce audio signals; they include the cathode ray tube, the color process, and the TV Antenna. The cathode ray tube generally called a CRT is a vacuum tube. Inside this vacuum tube are electrons that move rapidly from one field to another (negative to positive). These electrons stream from a positive to negative electric field onto a screen that is coated with phosphor. Phosphor glows when these electrons hit the screen creating an image. TV&apos;s create images by creating small pixels or dots on the screen. Thousands of glowing dots on a screen in a certain pattern create a picture. These dots are called pixels and the more pixels on the screen, generally the higher the resolution and better the image quality. 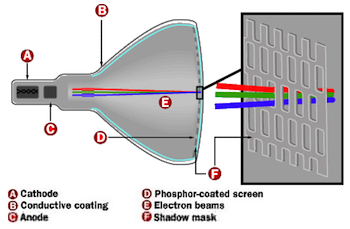 Within the cathode ray tube is a beam that shoots electrons onto a screen which is coated with Phosphor. While a black and white TV has one beam, color TV&apos;s have three beams; red, blue and green. Color TV&apos;s also have one screen which you view your image from, but behind this screen is a sheet of phosphor, black and white TV&apos;s only have one sheet of phosphor, color TV&apos;s have three sheets of phosphor; red, blue and green. The color TV creates colors by mixing both the three types of color beams (red beam, blue beam, and green beam) and the three types of color sheets (red sheet, blue sheet and green sheet). If you would like to create the color blue, the blue beam will hit the blue sheet in the back of the TV screen, for red, the red beam hits only the red sheet. To create yellow, both blue and green beams hit both blue and green sheets. White is when all color beams hit all color sheets. Black is when no beams fire at the sheets. An antenna is usually required to pick up and receive TV broadcast signals. TV broadcast signals travel a long range and face many obstacles such as walls and other obstructions. In order to capture a strong TV broadcast signal, an antenna is used. Antennas are usually composed of materials that can capture radio frequencies (usually metal). They are normally planted on the roofs of houses or on top of a structure. They are generally light weight and can be from one foot to 20 feet or more. Besides external antennas, there are plenty of antennas that are made for indoor use. These are smaller in size and weigh less. They may also include amplifiers to make the TV broadcast signal stronger. All antennas are attached to your receiver which usually is your TV set to give your TV set the best possible signal and ultimately the best picture possible. This is a exclamation by jade er. can you please label the diagram. The TV station makes the shows you watch on TV in form of electrical signals. Transmitters convert those to radio waves. Your TV antenna picks those radio waves up and your TV’s receiver converts it back to electric signals that your TV’s screen and speakers turn into images and sounds. 286 queries in 0.512 seconds.